This summer I’m doing a series of posts for Make Summer Camp, an effort to produce a number of creative works over the course of several months. I wound up doing quite a bit of paper-engineering, including a simple machine, and a lot of origami, and some bookbinding. 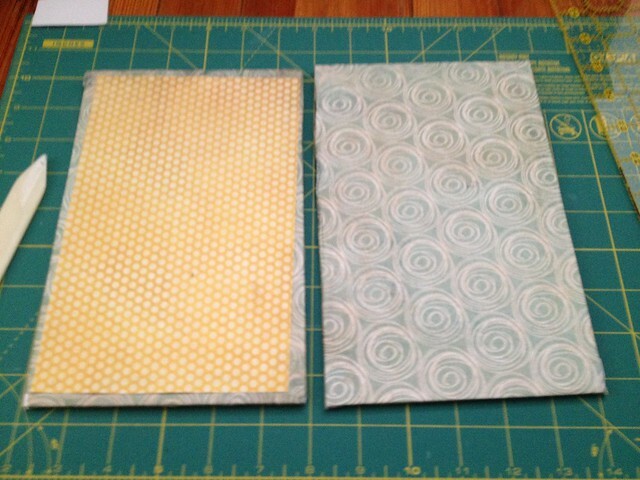 This is part of that third set of projects, bookbinding. I made a new coptic-stitch book. This is my third, after the first two. It’s hard to take photos while working with glue, because the glue dries so fast. But the first thing was making the covers. I have to get better at measuring and cutting paper to fit, and attaching it during the glueing process. As you can see from these covers, the internal yellow inside cover page is off center and at an odd angle. If you look really closely, you can see that the pattern of polka dots is cut at an angle rather than ‘straight’. 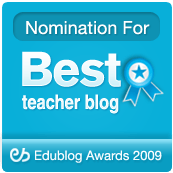 The same is true for the whorled paper on the right. The back of each cover shown has roughly the same problems on both sides. This is not a particularly new problem, but it shows the level of challenge that the bookbinder faces in producing a masterwork of the coptic stitch. Then comes the punching. Using an awl, I lined up a template and made holes in the two covers simultaneously. These holes are, unfortunately, much larger than they need to be. Next time, I think I’ll try to use a good needle or a thinner awl, at least when using foam-board as the basis for the book-covers, as I did here. I then transferred the template for the holes in the covers to the holes in the ten signatures of the book. This is simple copier paper. I made three possible templates of pages, which I’m making available here as Notebook Pages, so you can download them and make your own notebook (though I must admit that the gridded squares don’t photocopy well). Unfortunately, during the transfer of the holes to the signature, the template got turned upside-down and/or backwards, and some of the holes in some of the signatures wound up in the wrong places. If you look closely at the second picture, you can see that the holes in the signatures don’t line up with one another. That has long-range consequences, as you can see in the third picture with the book bound and finished. I also learned that it’s really important to weight the pages before assembling the book. Because otherwise it doesn’t assemble properly. You can see this in the second photo better than the third; the signatures don’t lie flat (and as you can see, the cover warped in the process of gluing the papers around the foam-board). When the pages are weighted for several days, the paper’s natural springiness gives way to a sharper fold. The result is a book that can be bound more tightly, and lies flatter even when open. These pages were run off the copier today (six sheets of paper in each signature, or group of pages; and therefore 24 pages to a signature; and 10 signatures, or 240 pages in this book), and consequently had no time to be weighted to lie flat before being hole-punched, or weighted after being hole-punched but before being bound. I think these are probably the marks of good book-binding, actually — the patience to fold and press each page separately, to fold and press each signature separately, and to weight each signature between each step of the process. No matter. This was a rush job, for several reasons. If you look at the third photograph in the set, you can see that the holes I made were not properly aligned. The result is that there are two lines of holes for the top-middle and bottom-middle stitch-lines in black, The bottom stitch-line (on the right) goes this weird arch in the middle; while the top-middle stitch-line has this weird extra jag where I went through the wrong hole during the binding process. The result is this very uneven set of lines. Also, you can see where the cord bit deeply into the foam-board of the covers, and nearly broke the book during the creation process. Once open, you can see a little of the variety of the pages. 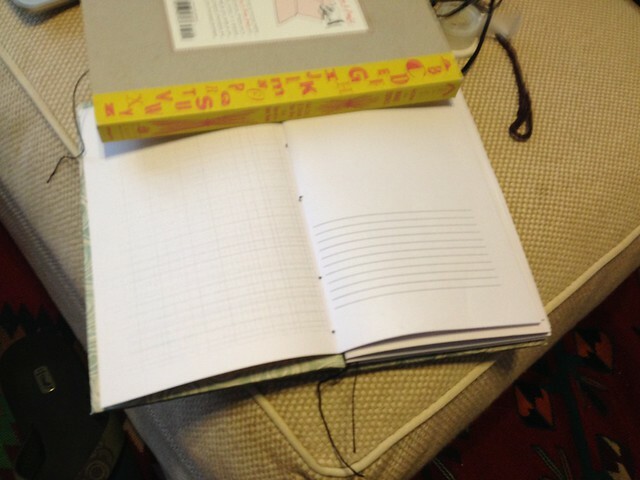 On the left is a gridded page; on the right is a half-lined, half-blank page. In retrospect, I wish I’d put in some all-blank pages, but it’s a design flaw I can correct in future versions of the Notebook Pages set. The book is weighted open with Esther K. Smith’s book, How to Make Books from Purgatory Pie Press, which has been my Virgil, my Beatrice, my guide for learning this process of making coptic-stitch books and books in general. I’ve not talked too much about the stitching process. This is a larger book than Esther recommends to beginners. In essence you need a cord which is as long as the spine of all of the signatures, plus the covers. 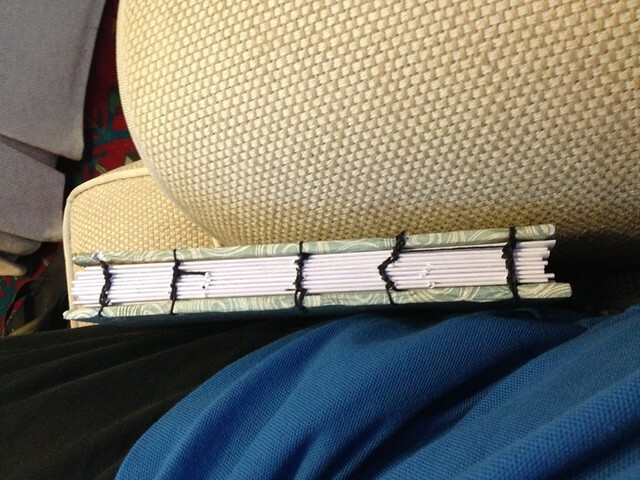 I needed three cords of waxed linen thread to complete the binding. But the real trouble is that the knots used to tie those cords together arrived at complicated points in the binding process, and did damage to the binding and to the signatures in the process of being put in place. Esther recommends a curved needle for coptic binding; I used a straight needle because I only have one, but I want to try a curved needle as soon as I get some spares to work with. use a curved needle, and use a straight needle, and figure out which works best for you. Book making is fascinating; loved this post. This weekend I’m going to bind a printout of the Spencerian Compendium of Penmanship. 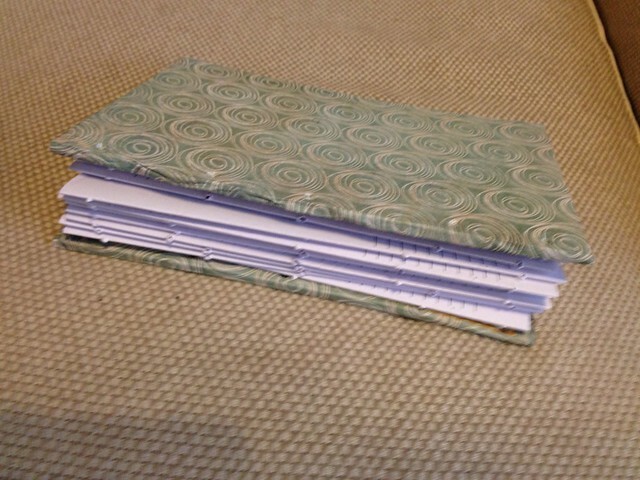 I’ll blog my binding this weekend. I’m going to go with a standard perfect bind as it’s about 200 pages. Plus, I have no idea how to print a PDF in signatures (although I’m sure somebody has figured it out and I’m sure a few hours of research would reveal the secret). Got you covered, Robert (edited the contents of your broken post into the more recent one). I look forward to reading your post, especially since the problem of making signatures is a real page-turner of a problem. 🙂 More seriously, the challenge is that the PDF assembles a book in the ‘correct’ order, and is theoretically un-alterable; while the signatures need to be assembled in a completely different order. I’m wrestling with putting together a collection of my poetry in a form that can be coptic-bound, but in the meantime I’m limited to notebooks where page order doesn’t matter. I found a thing on Pinterest about setting up a page layout program to flow text from an MS word document into signatures layout. But nothing about reordering a PDF file yet. Argh.